Resting close to your heart, and filled with a world of symbolism, a pendant is a truly special gift, given to celebrate true love and affection. The Shimansky-exclusive Millennium Diamond Pendant is both elegant and understated, yet it displays remarkable craftsmanship and design excellence. The perfect complement to the Millennium Engagement Ring, it holds a beautiful Round Brilliant Cut Diamond between two bands. 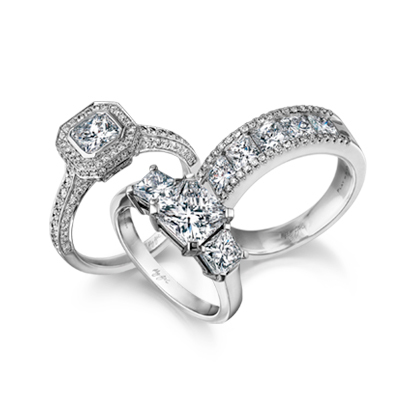 The diamond is the centerpiece of this piece, with its brilliance and scintillation the focal point. A remarkable jewellery creation, fit for a remarkable woman. The Millennium diamond pendant shown has been expertly set with a 1ct round brilliant cut diamond and can be crafted in pure platinum, 18K white, yellow or rose gold. Due to orders being hand made, delivery will take 4-6 weeks. Some things in life are worth the wait. At Shimansky we believe in creating a one of a kind jewelry design to celebrate those unforgettable moments in your life. Whether it's celebrating an anniversary, birthday or an engagement we understand the importance of these special memories to you. To assure quality, each diamond is mined directly from the South African mines before being transported to the Shimansky’s workshop in Cape Town, South Africa. A special and everlasting jewelry item that reflects true meaning and emotion is then designed and crafted by our very own in-house design team and skilful craftsmen for you to enjoy! Create an everlasting memory with a Shimansky original.